You are here: Home / Money / Business / Industry 4.0. (ThyBlackMan.com) The future is now. Several prominent thinkers are putting forward the thesis that we are entering a new era: the Fourth Industrial Revolution or Industry 4.0. 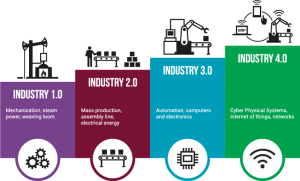 Distinct from the previous three – steam and water power, electricity and assembly lines and computerization – Industry 4.0 is comprised of cyber physical systems, the internet of things and the internet of systems. These are the new so-called “smart” technologies connecting machines and workplaces and making decisions autonomously. These technologies are changing everything from the way we book a flight to how we buy movie tickets. Ride sharing has disrupted the taxi business and now Uber is testing self-driving vehicles. The computing power in your pocket is greater than that used by earlier NASA space flights. This is having a profound impact on job markets which are predicted to further segregate into low-skill/low-wage and high-skill/high-wage jobs. According to Glassdoor, a job recruiting site, thirteen of the highest paying jobs are in “tech”, up from eleven in 2017. The jobs with the highest annual median base pay are in healthcare: physicians, pharmacy managers and pharmacists. Rounding out the top ten are jobs like software development manager, software engineer manager and software architect. These jobs require knowledge in the science, technology, industrial pendant lighting, engineering and math, or STEM, disciplines. The question is, will our kids be prepared for these and other jobs that will emerge in Industry 4.0? Results from the Partnership for Assessment of Readiness for College and Careers, or PARCC, tests for high-schoolers in the Nation’s Capital say no. A recent story in the Washington Post reported that at Frank W. Ballou High School in Southeast D.C. only 3 percent of the students passed the English portion of the PARCC test and an abysmal 1 percent passed math. In general, less than 5 percent of the students taking the tests in 2018 “were declared ready for college or careers” according to the Post. In their song, “Wake-Up Everybody”, first recorded in 1975, Kenny Gamble and Leon Huff of Philadelphia International Records wrote, “Wake-up all you teachers/ time to teach a new way/ maybe then they’ll listen/ to what you have to say.” Our children are the least to blame for not getting the type of education that will be required to thrive in the era of Industry 4.0. And we can’t blame the federal government, “the man” or other outside forces for our failing schools either. This is on us, the parents, teachers and administrators in our local communities to demand more, demand better, of our schools. We can’t fight the future, nor should we try. The technologies being developed in Industry 4.0 hold the potential to make life better for everyone: improved medical outcomes, reduced dangerous back-breaking labor and increased leisure time. If we don’t want immigrants to take the high-skill/high-wage jobs being produced, who will fill them? We can’t accept our children being short-changed. We should be outraged that after finishing twelve years of school our children still can’t read, write and count sufficiently to pursue higher education or start a career. This is on us. We have to fix this. Our children, our future, depend on it. Here is some push back on this article alleging a failure of our educational systems, and lauding our technological advances. America has the highest standard of living on earth and this standard is maintained by our educated offspring. I taught in public schools for many years and have witnessed our children mastering sophisticated technology such as computers, cellular phones,robotics and the like. Our technological gadgets are sold to our educated children who wouldn’t buy these things if they could not use them, and derive pleasure from using them. Our children can read, write, work math problems,conceptualize, invent and fabricate things with the best of them. The problem isn’t with our educational system,it is with the owners of businesses who don’t want a well educated work force because we know our rights, the law, and aren’t willing to be cheated out of a decent wage for the sake of the owner’s huge profits.